This information refers to last year´s edition so that it can be checked until it is updated accordingly to the 67th edition. The FESTIVAL commercialises its tickets exclusively; it is therefore absolutely forbidden for unauthorised third parties to proceed with their resale, commercialisation and/or distribution in any way and/or by any means, including, but not limited to: gifts as part of sales promotions, fund collecting campaigns, draws or any other kind of commercial promotions. Said exclusivity, and the exclusivity held by the FESTIVAL with regard to all of its brands, logos, anagrams, products and activities, is protected by the laws and by the provisions contained in the laws on industrial property, intellectual property, brands and advertising, as well as by the international treaties regulating such subjects, and, especially, copyright. The FESTIVAL reserves the right to take the appropriate legal action against persons or bodies contravening said prohibition, in order to defend its rights and public image. Tickets for all afternoon and evening screenings, including galas, at the Kursaal Centre (K1). There are two zones for evening screenings: B and general. The organization will put a limited number of these tickets on sale. Bookings: 16-20 September at the Kursaal Centre box offices from 09:00 to 20:00. Purchases are limited to a maximum of 4 tickets per session and person. San Sebastián Film Festival seats are not numbered. All other screenings: On sale from Sunday 16 September at 09:00. Channels: online and Zinemaldi Plaza ticket desks. Tickets will go on sale for the Official Selection B zone, except for the Opening and Closing Galas. - 16:00 showings: tickets will go on sale at 08:30 in the morning. - Other afternoon and evening showings: tickets will go on sale at 17:00. Internet sale commission: € 0.75 on every ticket. ONLY applicable to screenings priced € 7.90. Applicable online and at box offices. In addition, holders of these cards will only pay €1 for films subtitled in Basque. Purchases with these card will benefit from 10% discount on the price of each ticket. DONOSTIA KULTURA CARD: only valid for the Zinemaldi Plaza and Victoria Eugenia box offices. Only valid for the Zinemaldi Plaza. Entry to the cinemas is not permitted once the screening has started. Tickets, once purchased, cannot be changed or refunded except in the case of changes to the programme or cancellation by the San Sebastian Festival. In such cases the amount will be refunded or the ticket exhanged for another at the box office of the cinema at which the inciden has occurred or at the Zinemaldi Plaza ticket desks. At the ticket dispensers. We recommend that you collect them before the start of the Festival. HOME TICKET: print at home or take it on your phone for all the screenings. How and when can I buy tickets? Opening and Closing Galas: early bird tickets generally go on sale from May onwards on the official Festival website. Donostia Award Galas: once the announcement has been made as to the person to receive the Donostia Award, early bird tickets go on sale on the official Festival website. Culinary Cinema: on sale from the beginning of September on the official Festival website. Remaining tickets: the Sunday prior to the start of the Festival from 9:00 through all channels (Internet and Zinemaldi Plaza ticket desks in the Kursaal Centre). Season tickets for the Official Selection in the K1: from the Sunday before the start of the Festival until the day before, from 9:00 at the Kursaal Centre ticket desks. Once the Festival has started, tickets will be sold at all venues to host screenings. To what sessions does the Official Selection season ticket give me right of access? The Official Selection season ticket includes the Opening, Donostia Award(s) and Closing Galas, as well as all afternoon and evening screenings in the K1. What is the difference between the General Zone and Zone B in the Kursaal? 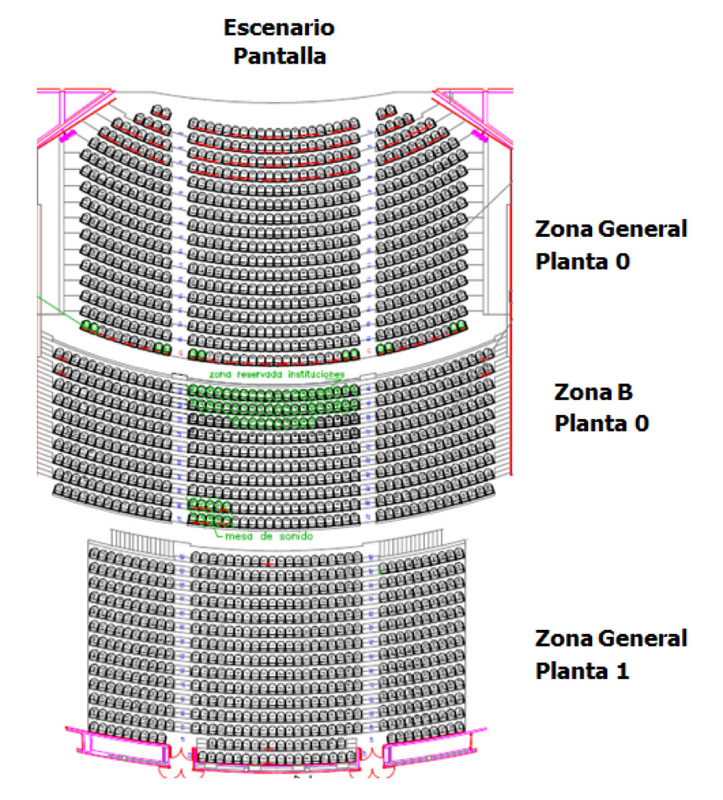 Zona B consists of the seats in the centre of the auditorium. This zone is more limited and only a very few season tickets go on sale for it. What do the Galas involve? At the Opening Gala, the contents of the addition are presented; the event is attended by the members of the official jury and the team of the film to be screened following the ceremony. At the Closing Gala, a rundown of the edition in images is given and the Festival Awards are announced, followed by their live presentation. What films will be screened at the Galas? The films screened after the galas are announced on the official Festival website once they have been established by the organisation. What is the daily sale? This is a small number of tickets which goes on sale on the same day of screening. The number of tickets going on sale for each session is the same on all channels. The sale in Zinemaldi Plaza and online starts at 8.30, and at the other ticket desks, 30 minutes before the first screening. You may therefore find that some sessions are sold out when the cinema ticket desks open. How many tickets can I purchase for each session? Each person can purchase a maximum of 4 tickets for each session. Where can I print my tickets? Tickets purchased over the Internet can be printed at home, if you have chosen the Home Ticket system; either that, or you can display them on your mobile phone. Otherwise, you can choose to print them at the collection stands found in the Zinemaldi Plaza ticket desks (in the basement of the Kursaal Centre) and in the larger Kutxabank ATMs. The San Sebastian Festival organisation accepts no liability for lost or stolen tickets. How can I purchase tickets to see a short film? Short films are always accompanied by a feature film, meaning that to buy your ticket you will have to do so according to the title of the accompanying feature film. When purchasing tickets, you can enter the short film title in the search engine; this will take you to the sale of tickets for the corresponding session, although it may actually be the title of the feature film which comes up. To which ticket do discounts apply? Discounts are only applied to tickets costing 7.90 euros. In online purchases, how can I obtain a 25% discount? The 25% discount is applicable for purchases of 10 or more tickets in a same operation. To obtain the discount, you must add your tickets to the trolley; on completing your purchase the 25% discount will be automatically applied to tickets purchased at a price of 7.90 euros. Can I accumulate different discounts? No. Discounts cannot be accumulated. In the event of cancellation, how is the cost of the ticket refunded? Once a ticket has been purchased, it will be neither changed nor refunded, unless there is a change in programme or cancellation by the Festival. Refund of the amount or exchange for another ticket must be done at the ticket desk of the venue where the incident occurred, or at the Zinemaldi Plaza ticket desks (in the basement of the Kursaal Centre).